Following our lovely Campo Viejo Rioja Reserva, my sister and I went rummaging about in my wine bar rack to choose a bottle to accompany dinner. We had made many cheese raviolis with a basil-alfredo sauce, roasted brussel sprouts and barbequed tempeh, so we fancied something on the lighter, dry side to befriend our somewhat odd mix of super fattening, yummy and yet also healthy dinner. 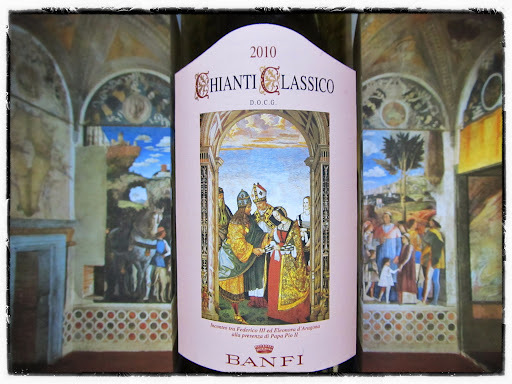 We decided a Chianti would be perfect, and popped open Castello Banfi Chianti Classico 2010. Castello Banfi is a family-owned vineyard estate and winery in the Brunello region of Tuscany. With the addition of its sister estates In Piedmont, it offers a full range of wines for every budget and preference. Due to their dedication to innovation and excellence, they have been recognized around the world for their achievements in winemaking. Perhaps their most commendable award is “First Winery in the World Recognized for Exceptional Environmental, Social & Ethical Responsibility and Leadership in Customer Satisfaction”. They pioneered research on Sangiovese clones and registered the results in order to share the research with neighboring vineyards. Through technological innovation and respect for tradition they have achieved a more organic winemaking throughout their labels. They employ nitrogen bottling to eliminate the addition of sulfites, they developed hybrid stainless steel and oak fermentation tanks to balance flavours and allow the terrior to shine through, they practice water conservation, erosion control, and maintain biodiversity, which is just a few of the many methods they have successfully implemented throughout their 7,100 acre estate. Transparent ruby in colour, aromas of ripe cherry and rose petals with a subtle undercurrent of earthy olive radiated from the glass. Fruity strawberry and tart cherry flavours were supported by hints of earthy leather and peppy, dry tannins in the medium body. Spicy white pepper and woodsy oak elements constructed the moderate finish. Smooth and easy drinking, this is a fantastic everyday glass for the table. Bottled by Banfi S. A. S.r.l.